I'm up early, or I should say, my normal time. I heat water for coffee, I need to maintain some semblance of civilized behavior. This is the third day of hiking in the Oregon forest since leaving Ashland. Hiking in the forest without a view to where I'm going or where I've been. The first water I encounter is after hiking eight miles. Christi Springs is little more than a trickle of water seeping out of some rocks. I take a liter to go and drink a liter like I always do. I hop back on the trail and then check to see where the next water source is. Uh Oh, sixteen miles! I think about going back to the spring. I check the water report for other sources. I just finished drinking a liter so it's hard to imagine ever being thirsty. I know I will be and it weighs heavy on my mind. I decide to keep going, worst case scenario will be that I have to go to one of the off trail ponds and filter scummy water. I'll try to ration my water usage. After all this is Oregon. The trail’s pretty much flat and smooth, right? On and on I hike, deeper and deeper into the forest. Without the trail I'd have no idea of where I am or where I'm going. I just have to trust that the trail will eventually lead me to where is says it will lead me. I can't see the forest for the trees. Downed trees block the trail. I'm spending lots of time and energy climbing over, around, under trees that have fallen over in winter storms. There are so many downed trees I can't even see the trail. There are little trails of use around the downed trees. I meander all over the forest. In the back of my mind is the thought, “you only have less than a liter because you just had another sip of water.” The sun blazes down. From some reason the trail is lining up with the angle of the sun and the shade is gone. It's hot! No breeze, mosquitos are out and looking for an easy meal. An easy meal is when I stop. The moment I stop moving they swarm all over me. I put on insect repellent. That keeps them hovering. Like they know I'm there but can't seem to be able to find me. It's amazing the difference and how well my insect repellent works! Now I just have to listen to them, they don't land. The trail turns rocky, then rocky-cobbly, my least favorite kind of trail. I slow to a crawl, not literally, I am still walking but it's slow, hard going. My feet are taking a beating. They hurt, I feel like stopping. There isn't a place to stop. Stopping means that I don't get to the next water source. I saw a few Thru-hikers at Christi Spring. When I got there they took off. I'm completely alone in this maze of a forest. On and on I go. Things look the same as places I've already been. Then I start climbing. The trail goes up and up. Not like a California up. A moderate climb. It's hot and I'm climbing. I don't have much water. This is not good planning. Conserve, it's been worse, the desert was worse than this, I can do this. The trail climbs right up out of the trees. I'm on a rocky ridge, following it to Devil’s Peak according to the map. The water sources are on the other side. This ridge goes on and on for seven miles. I can finally see where I've come from. When I get to the other side I'll be able to see where I'm headed. This is at least visually interesting. That's not necessarily a good thing when the trail is this rocky. I try to always stop before looking up and around. Mostly though, I just watch the trail. My feet hurt too much to risk hurting them even worse by not paying attention. Late afternoon I finally arrive at the water source. I am completely out of water. Drinking the last small swig in the last mile. I drink two and a half liters and load up with another two and three quarter liters. The next water source is Mazama in Crater Lake National Park. That is another twenty one miles from here. I make a peanut butter tortilla and eat some cheese and beef jerky. The water and food give me new strength. I press on another five miles to make the trip tomorrow shorter. 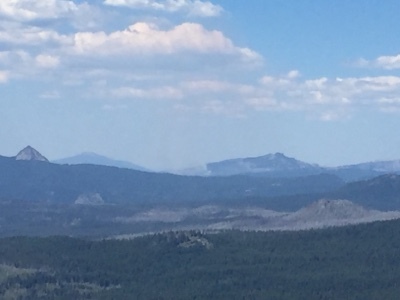 I've heard rumors from some southbounders that now both the PCT and the Rim Trail through Crater Lake National Park have been closed due to the fire. My goal is to get to Mazama, get my box, and assess the situation then. Since setting up camp, a few other Thru-hikers have arrived. Wozzie is camped here as well as Pierre, Remy, and Max. The camp is a flat spot in a dell along a trail that is sloped one direction or the other. Under the canopy of fir trees, the ground is pretty open with minimal shrubs and other plants. The mosquitos are worse here than anywhere else I've been so far. The buzz in an incessant cloud around my head providing an annoying whiny background noise to my dinner cooking exercises. I finish dinner and my chores and gratefully climb into my tent, my bug free zone, exterminating those bugs who chose to violate the sanctity of the zone. I can still hear their whining but it's further off, it eventually ceases and darkness closes in and the night turns cool. I fall asleep to the sound of coyotes howling in the distance.